In České Budějovice the train and bus stations are across the street from each other, about ten minutes' walk east of the historic centre. The bus station is upstairs above a modern shopping centre and the train station is an historic building from the 19th century. Both are very well organised and it's easy to find your way from one to the other if your connections require it. From Prague by bus the 160km trip to Budejovice takes as little as 2 hrs 20 mins which is at least 20minutes faster than the train. Part of the reason that the buses are faster is that they often leave from Na Knížecí bus station in Prague's southern suburbs, so check your departure point carefully. The fare is around 150Kč whether you travel with Student Agency or one of the other operators. From Prague by train takes at least 2 hrs 40 mins to cover the 169km to České Budějovice, and the full fare is around 213Kč but if two or more people travel together by train they become eligible for the small groups discount and this makes the fare 160Kč, which is comparable to the bus. From Český Krumlov, buses cover the 28km to České Budějovice at least hourly during the day. The trip takes 35-50 minutes and the fare should be around 32Kč. There are also trains but very few foreign travellers use them because they are slow and the Český Krumlov train station is such a long way from the centre of town. 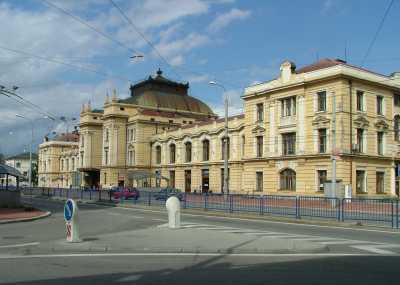 From Vienna Westbahnhof, trains via Linz cover the 315Km to České Budějovice in as little as 4 hours and 5 minutes. There are also more direct services via Gmund from Vienna Franz Jozefs Bahnhof that take 3 hrs 30 mins only two departures each day. Buses are slow and extremely indirect. From Munich, trains travel the 405km to České Budějovice in around 5 hours 30 minutes, with a change either at Salzburg or Linz. Cheaper but slower is to take a Student Agency bus from Munich to Plzeň and switch there for the train to Budějovice. Click here to calculate International fares. From Plzeň direct trains depart every two hours during the day for České Budějovice, taking a little less than 2 hours to cover the 136Km for 176Kč (131Kč per person with the small groups discount). From Karlovy Vary it takes 5 hours to 5 hours 30 minutes to reach České Budějovice, either by train or bus. There are no direct connections; the changes are either in Plzeň or Prague. If you choose the route via Prague, check carefully which of the three bus stations there the arrival and departures are to and from. From Olomouc, Brno and Telč, You'll probably arrive in České Budějovice on one of the four daily buses that traverse the Brno-Budějovice route in 4 hours. From Olomouc it can be just as quick to go via Prague, but it's further so will be more expensive.